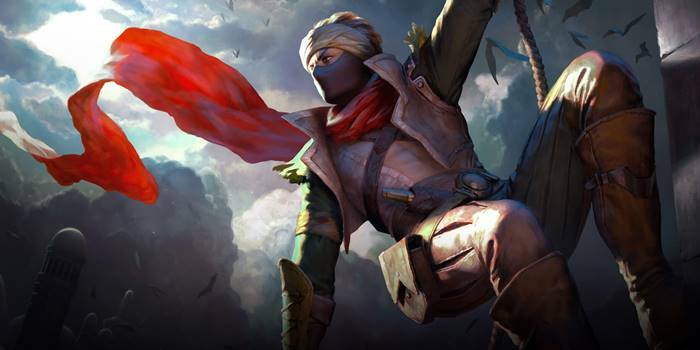 Guide for the hero Murad, a character in Arena of Valor (AoV). Included are Murad’s abilities, statistics, attributes, strengths, weaknesses, and more. On Murad’s 4th consecutive normal attack within 3 seconds (ineffective against buildings), he gains 24 (+3 every 2 levels) attack damage and releases the seal of Temporal Turbulence for 5 seconds. The basic attacks don’t have to be on the same target. Murad leaps forward, dealing 120/144/168/192/216/240 (+1.0 AD)ˀ physical damage to enemies in his path and stunning them. He can leap again within 5 seconds of the initial cast, and he can return to his starting location if the ability is cast a 3rd time within 5 seconds. Murad creates a distortion in space and time that deals 110/142/174/206/238/270 (+0.55 AD) physical damage to all enemies in the distortion field. Also deals 180 (+0.9 AD) physical damage to those entering or leaving the distortion field and reduces their movement speed by 90% for 2 seconds. In addition, he lowers target armor by 100 for 3 seconds. Murad cannot be targeted or attacked while creating the distortion. Murad enters a temporal rift, unleashing 5 attacks on enemies in the target area, dealing 150/215/280 (+0.7 AD) physical damage per attack and 50% of life steal effects apply for these attacks. While in the temporal rift, Murad cannot be targeted and attacked. This ability can only be used after Murad’s passive opens the seal, which will close again after use. *Life steal value is not shown on the SEA server. Temporal Turbulence can only be triggered by landing continuous normal attacks, so focus and make sure all those attacks make contact. Triggering Murad’s passive gives him a burst in damage output, so make sure he is not under any control effects when it’s about to trigger. Our recommended order for Murad abilities as he levels up. See all of Murad’s item builds. Can you guy’s extend Murad’s tempo turbo’s seal by 0.5 sec? It’s really hard to murder people with tempo turbo when I unlocked the seal and they start running away. That 0.5 sec can be really handy for extending the time a lil bit so that split second my enemy is very close to me won’t be a bust. Actually nevermind, how about putting a new item? The Andura Stone? For 90 sec, Murad can use Temporal Turbulence freely and gains 10% atk dmg. But using an ability increases it’s decay by 0.3 ( or any time you wanna put ) and returns back to normal after the ability is finished like using Another Dimension, that 0.5 sec usage increases it’s decay by 0.3 and stops once the ability is finished. Like the idea? Or screw it? Adding an item tied to a specific hero is an interesting concept but would be exceptionally hard to balance within the game. I agree but someone said that waiting for the Rift passive for 2 sec after striking someone’s face with a machete for three times will extend the Tempo Turbo seal for 9 sec. Is it true? This does not lengthen the amount of time that the ability is unlocked but rather allows you more time before all of your stacks reset. Simply put, each time you attack resets the timer for how much time will pass before Murad loses all of his stacks. So instead of slashing someone’s face off with a machete while giving a short break of 2 sec, it just gives me a total of 8 sec, giving me time to not waste my mana going back and forth trying to get my enemy. So this tactic is useful when my teammates is trying to lure the enemy while I wait for the perfect opportunity? That’s not true… You have to slash their leg with a butchers knife. You realize these people aren’t the developer’s, right? Of course not, so…they aren’t the developers. so fafnir’s talon’s passive doesnt work with murad’s ult ? Just tested to make sure. Fafnir’s Talon’s passive does not apply when Murad strikes with his ultimate. Why to use guerrilla and not assassinate as murad’s arcana? Getting attacks in for his ult is of utmost importance with Murad. Just in case you ask “then why Soulreaver over Scorching Wind,” the answer to that is that CDR is more important there, again for his ult. Ah, no. Apologies, one of us wrote that when we discovered that life steal effects count (at a time when they weren’t included in the description). Yes, the final dash back does not deal damage (at normal speed it looks/sounds like it does, but if you watch in slow motion, the last hit is from the previous dash).